The store’s founder James Richeson “J. R.” Millner (1862-1915) was the son of James Monroe Millner and Josephine Richeson of Amherst County, Virginia. His father, James, was a prominent merchant in a locality once called Millner’s Store and later renamed Allwood. 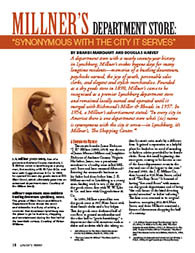 Entering the mercantile business as his father had done before him, J. R. Millner moved to Lynchburg as a young man, finding work in two of the city’s dry goods stores, first with W. W. Tyler & Co. and later with Guggenheimer & Co. In 1890, Millner opened his own dry goods store at 802 Main Street with three female clerks and a boy helper. This dry goods store dedicated half of one floor to general merchandise and the other half to “gent’s furnishings,” a department that sold menswear such as shirts and neckties while also taking orders for men’s suits made by a different firm. It gained a reputation as a helpful place for bachelors in need of mending or fashion advice provided by its female clerks. From this small beginning, the store grew, coming to be known as one of the finest department stores in the city and one of the largest in the state. Around 1903, the J. R. Millner Co., then located at 920 Main Street, called itself “The Busy Store.” It boasted of having “five retail floors” with numerous dry goods departments and of being “the only house of the kind devoting special attention” to ladies’ tailoring. 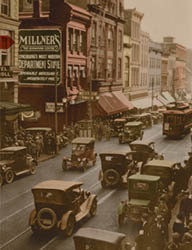 The firm soon returned to its original location, occupying 802-804 Main Street, and there Millner’s remained a fixture of downtown shopping for half of a century. Brandi Marchant recently completed a master’s degree in history at Liberty University and is a museum guide with the Lynchburg Museum System. Douglas Harvey serves as director of the Lynchburg Museum System.